You may also want to have a look at some pictures of the region. Juan les Pins is a small city famous for its beaches and lies close to another small city called Antibes and Nice (25km). Nice itself is 1000 kms far from Paris, the capital of France. In order to get some first orientation, you might want to have a look at one of the following maps: Antibes Region, Juan Les Pins, or Old Antibes and Juan Les Pins. Participants of ISCC'2000 are invited to use the private beach of Bijou Plage all the day on the 5th of July. There are cabines to take shower and change. Please check with the local conference organization for more details. It is strongly recommended that you make your reservation as soon as possible since the conference happens in the hot season of the French Riviera. The company Carlson Wagon Lits is happy to help you through hotel reservation. Carlson Wagon has a number of hotels in different price categories. You have to download the hotel reservation form , fill it out and send it back by fax to the number +33 1 55 07 26 15. Due to an ecologic incident in the Bretagne (sinking of Erika) the region around Antibes is running out of hotel rooms. We may be pressured to release unwanted room at the end of May, so please reserve your hotel room as early as possible! You may also look by yourself for a hotel room. The websites http://www.antibes.com/ and http://www.aaacom.com/hotelreservation/ contain some information about accommodation in the region and may be of help in this case. 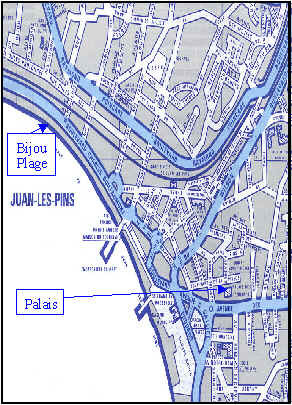 Note: You need not necessarily be in Antibes / Juan les Pins for the conference since there is a railway station nearby the Palais des congres (Called Gare de Juan les Pins) where the conference is held, so you can stay for example in Nice but take in consideration 1/2 hour of travel from Nice to Juan les Pins. By Air: The Nice International Airport (see also http://www.nice.aeroport.fr/), 22 km to the east, is available by bus, train and car (taxi). By Train: Antibes is on the main Paris-Lyon-Avignon-Nice-Italy line, with local trains serving most of the coastal towns. Prices vary by day and season, but a typical Antibes-Nice round-trip cost around 42 F. [Rail Map]. Practical information on traveling by train in France may be found at the website of the French Railways SCNF. All major companies are available in the Airport. Remember that booking a car from abroad is cheaper than taking it in France, as rates are higher once you arrive. It will be difficult to park your car in Juan les Pins at this time of the year unless you park it early in the morning (before 10 AM). The proposed visit to the Oceanographic Museum of Monaco with a short visit to the Palace has been canceled due to a lack of sufficient subscribers.